I glance to my right and what do I see? I turn north and what do I see? Home to the one who took my name. 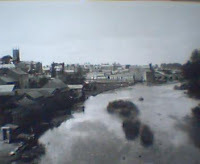 Left a view of the river Boyne from the railway viaduct before the new road was built and right with the new road. Michael '' The Sheriff '' Sheils.